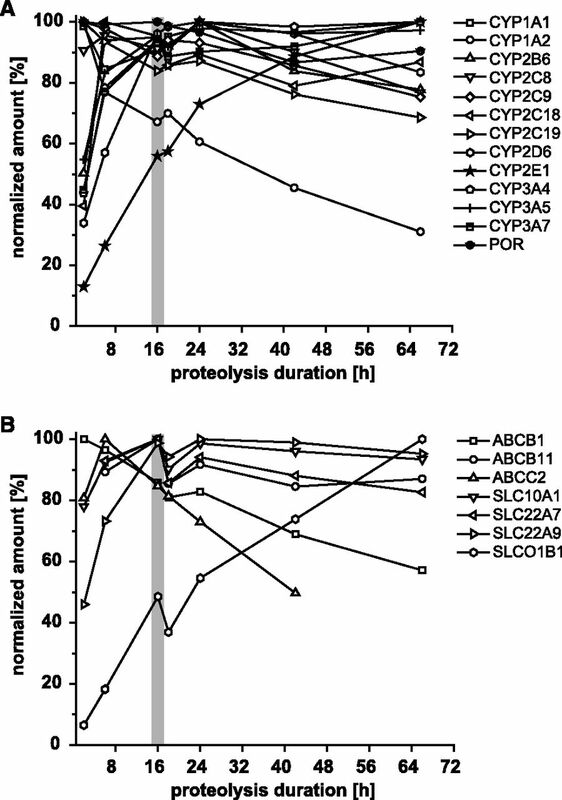 Frequency of C-termini after immunoprecipitation from proteolyzed HepG2-lysate (technical replicates, n = 3) using the TXP antibodies anti-LAER (A) and anti-FVEK (B). Peptides were analyzed by high-resolution tandem MS and identified combining the MASCOT and SEQUEST algorithms. Enrichment analogies were identified considering statistical significance (P = 0.05). Single epitopes were weighted for the number of identified peptides and combined in a motif logo. Size of the letter represents percentage of identified peptides carrying the respective amino acid at this position. (A–F) Accuracy and recovery of selected MS-based immunoassays. 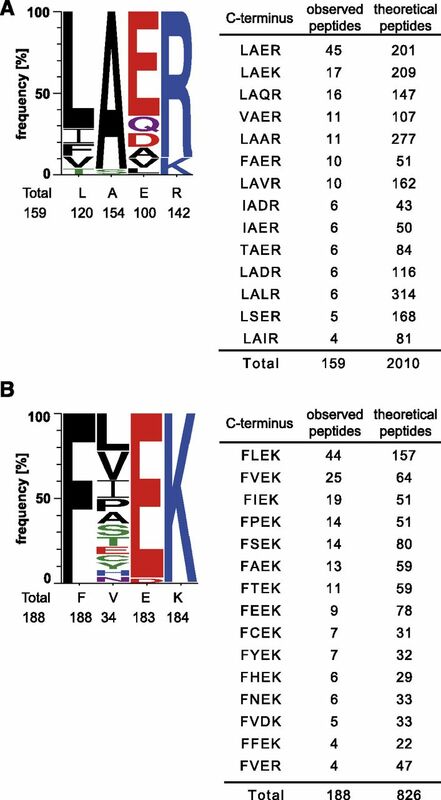 Isotope-labeled peptides were serially diluted in analyte-free buffer containing proteolytically fragmented fish gelatin, while sequence-identical nonlabeled peptides were kept constant (technical replicates, n = 3). For immunoprecipitation, absolute peptide amounts ranging from 1000 to 0.15 fmol were provided. By using the signal of the nonlabeled peptide, the isotope-labeled peptide amount was back-calculated and plotted as recovery. Linearity of approaches is demonstrated over at least three orders of magnitude. Mean and S.D. are depicted. Digestion kinetics. P450 enzymes (A) and transporters (B) were quantified considering different digestion periods. Maximum quantified peptide concentrations were set to 100% and declared as the normalized amount. The optimal digestion duration for the analysis of all analytes in one experiment is indicated in gray. Representative experiment is shown. Quantification of recombinant P450 proteins. P450 enzymes expressed in bacterial membranes and standardized using a spectral determination method were quantified using MS-based immunoassays. The ratio between TXP quantification and spectral quantification was determined (technical replicates, n = 3; mean and S.D. are shown). (A) Quantification of P450 enzymes and transporters from liver tissue T (set A) and three different fractions (crude membrane/nuclei fraction, CMF; microsomes, M; and cytosol, C), from one preparation from tissue material of donor 4 (technical replicates: T, CMF, and C n = 3; microsomal preparation was measured as a single replicate due to the limited amount of sample; mean and S.D. are shown). (B) Enrichment of analytes by CMF and microsomal preparation. 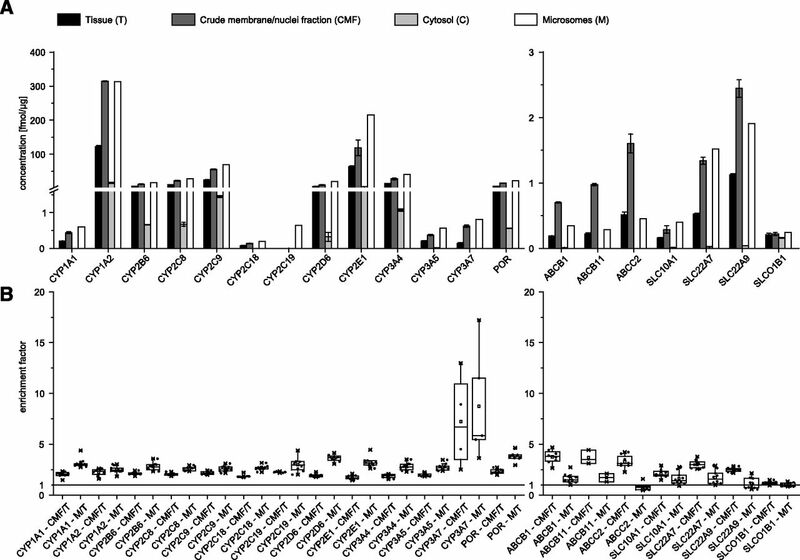 Ratio between either CMF or microsomal preparation (M) and direct quantification strategy from tissue (T) was determined. Results are depicted as a box blot (box: 25th, 75th percentile, whiskers: <1.5 IQR (interquartile range); all values are depicted as dots; minimal and maximal values are indicated as X). Reproducibility and variation of MS-based immunoassays (technical replicates, n = 9). Three tissue samples (from set B) had been selected. P450 enzymes and transporters were quantified in triplicates on three different days (*: less than LLOQ). Tissue studies. Quantification of P450 enzymes and transporters in human liver tissues of 15 liver samples (set B). Results are depicted as a box blot (box: 25th, 75th percentile, whiskers: 5th–95th percentile; all values are depicted as dots; minimal and maximal values are indicated as X, technical replicates: n = 3). 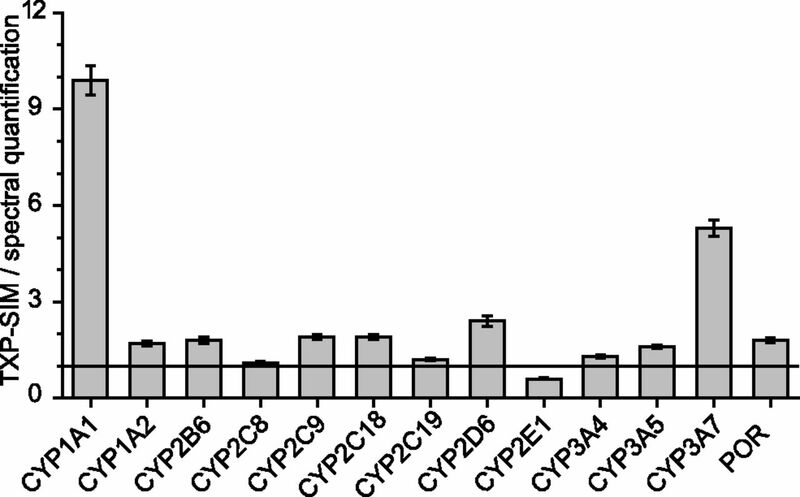 Quantification of CYP2C19 (A), CYP2D6 (B), and CYP3A5 (C) with reference to the donor’s genotype. Ten Liver tissues selected according to previously determined relevant genotypes were analyzed with the direct quantification strategy from tissue (set A). Mean and S.D. are given (technical replicates: n = 3). Induction studies. Induction qualified human cryopreserved hepatocytes were cultivated in 96-well plates. Cells were seeded at the same time and treated with rifampicin (10 µM), phenobarbital (3 mM), and omeprazole for 72, 48, 24, and 0 hours prior to harvesting. 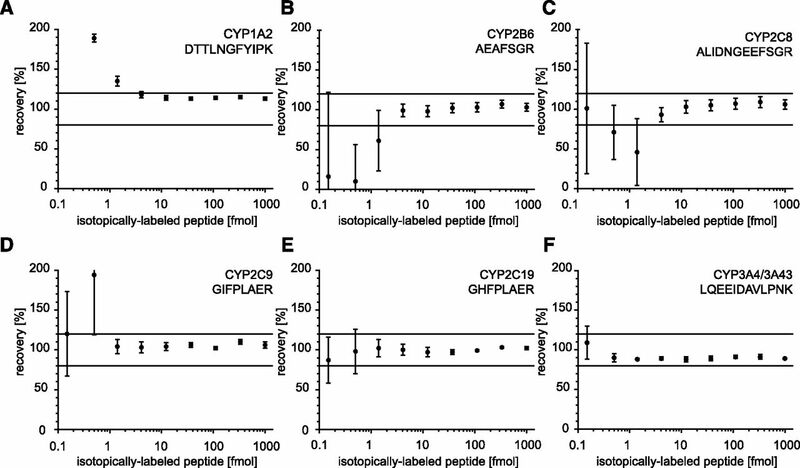 The P450 enzymes CYP1A2, CYP2B6, CYP2C8, CYP2C9, and CYP3A4 were quantified using MS-based immunoassays (biologic replicates, n = 3) (A–E). The protein expression after cultivating cells for 72 hours using maintenance medium without dimethylsulfoxide was used as the initial point of the visualization (T72, treatment duration: 0 hour). 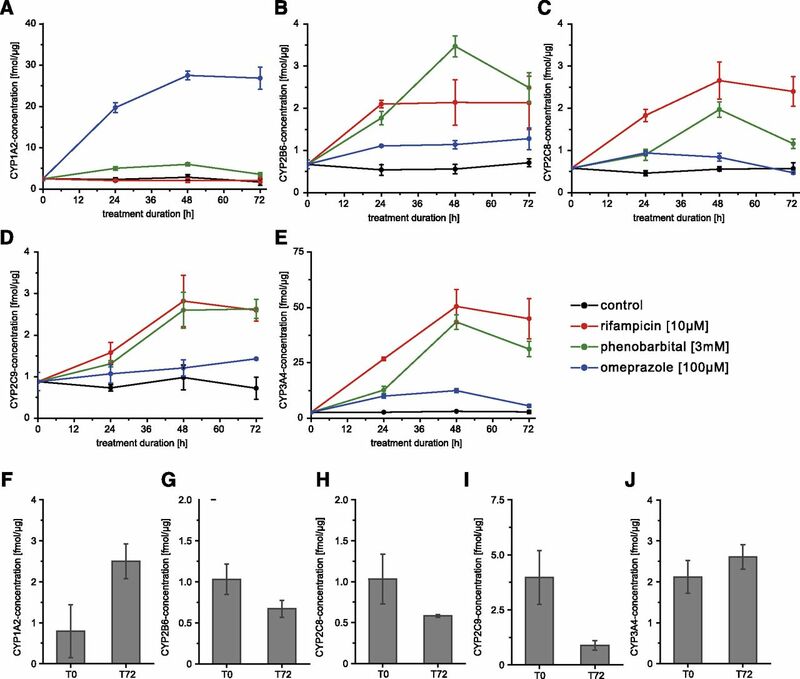 Dedifferentiation effects on the expression of the P450 system were observed by comparing basal enzyme levels after adhesion phase (T0), with expression rates after the whole cultivation time (T72) (F–J).